With every turn of a new year, one of the most heard of resolution is having a healthier lifestyle. But let's admit it: At this age of everything fast-paced and can be delivered right at your doorstep (pair it with, at least in my case, slower metabolism and a graveyard shift working schedule), healthier options in terms of food is very limited. I always thought I never had the time to prepare something of the lesser evil, and frankly, I would really rather chow some piping hot rice or spoonfuls of mashed potato, or if workload is too heavy, munch on potato chips and chocolates while working my day away. I'm sure we all have heard of the Juju Cleanse once before, right? It was such an 'in' thing the past year. It's the convenient (because they deliver!) juice cleansing that detoxifies your body, giving it that much needed kick of health. The same people who started Juju Cleanse also brought us Juju Eats. Their aim was to "reboot your palate and help every one realize that eating well can be easy and fun." Last year, I started adapting a healthier way of living. I went to the gym with Muffet at least thrice a week, cut back on carbs and sweets and basically, everything was in moderation. It was great because gym was near work and we had a colleague who customizes our food for us to fit our needs. But the latter part of the year, I began skipping working out and loosened a bit on the moderation part. Hahaha. Especially come the holidays! 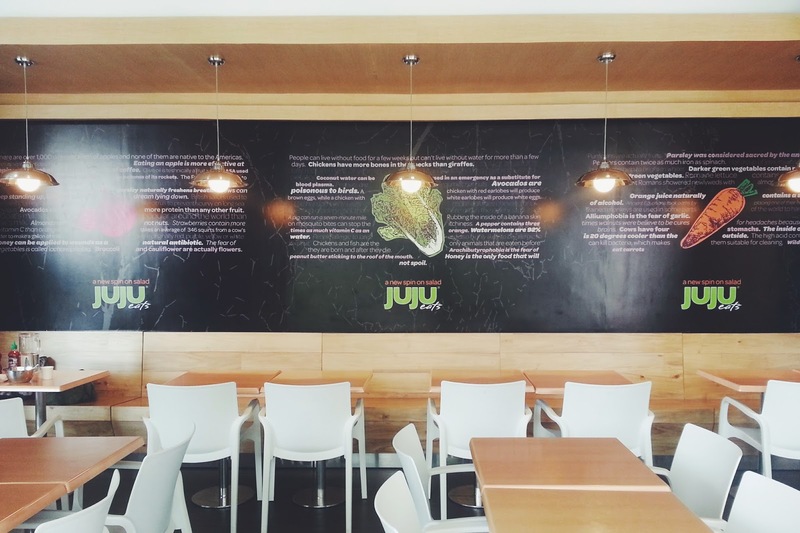 Good thing that a branch of Juju Eats opened across our building. 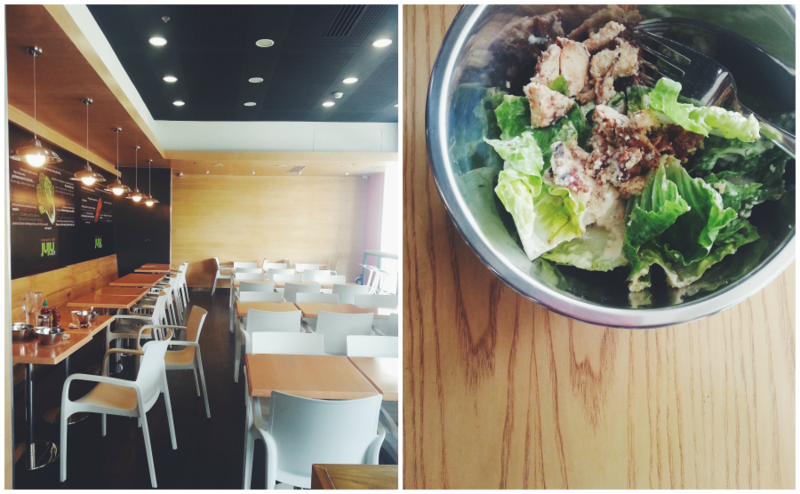 We've only dined there once but it's really kind of reassuring to know that amid all the fast food chains and convenience stores that surrounds us, there is an accessible, call it, salad bar, if I may, that we could go to, to eat something healthy without being boring and bland. I decided to join some friends planning to eat here one morning. We found out that they have such a wide variety of greens (base), toppings and dressings that you could choose from, you could have so many approaches to the salad you want! 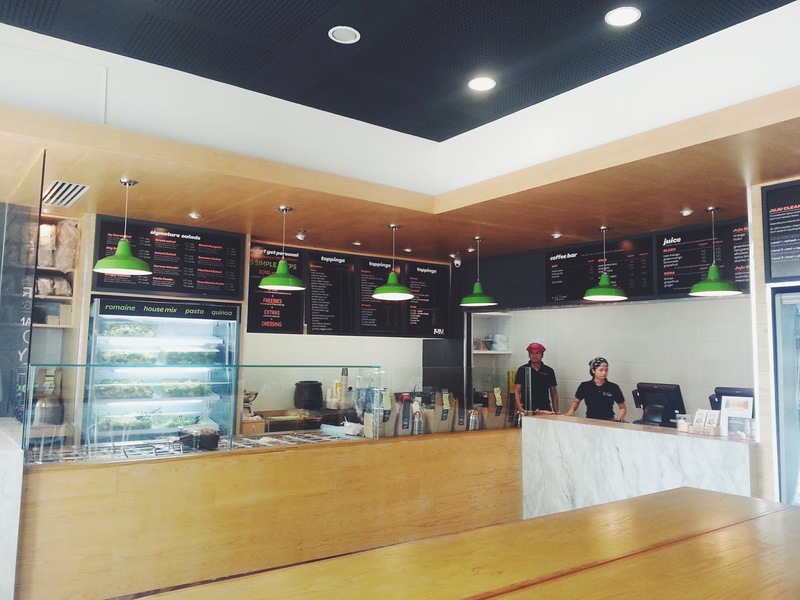 They also have signature salads that you can order in regular size, half or just opt for it to be in a wrap. The flavors are really diverse, it's hard not to have a favorite. 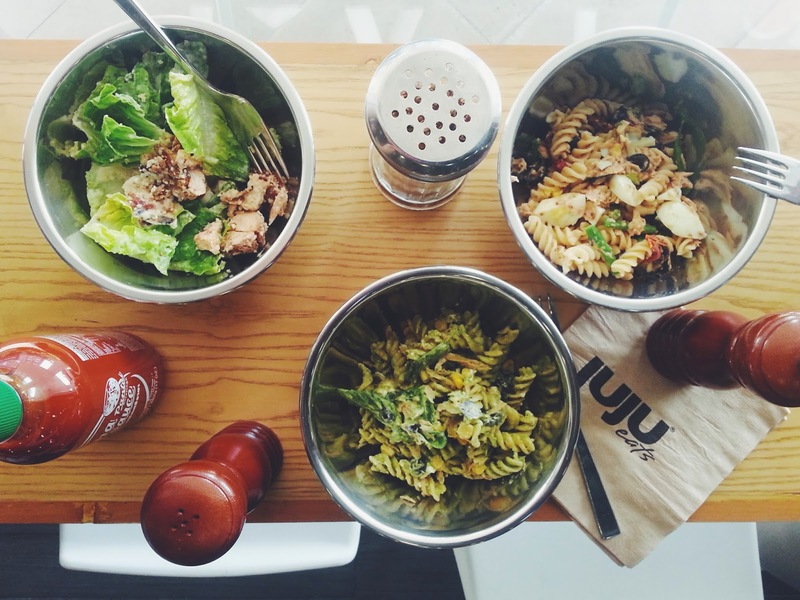 And just because Juju Eats mainly serves salads, don't, for a moment think, this is solely a vegetarian's paradise! They also serve chicken inasal, beef, pork inasal, bacon (!!! ), tuna and catfish. The choices and number of permutations your salad could turn out is just countless so the newbie in me decided to stick with the signature salads first. I'll experiment later on. Haha. I ordered the most basic of all: Chicken Caesar salad plus extra feta cheese! Muffet had the Pesto Pasta (middle) and Bell had the Tuna Nicoise Pasta (right). Of course, the hero of my Chicken Caesar salad is the chicken. Haha. It was just packed with flavor and really tender. I was quite afraid that the chicken breast would turn out dry and flat. There were also croutons that was (hurray!) not soaked in dressing and added that right crunch for texture. For a moment there, I forgot that I was eating greens because I was enjoying my meal so much. And by the time I finished it, I was full! Muffet and Bell were also all praises with their choices! We finished our meal each with a bottle of cold brew beverages (also, we're really curious how they taste!) I was supposed to have the mocha nutmilk but I guess someone else got the last one on the shelf so I settled for the Mexican mocha (left). 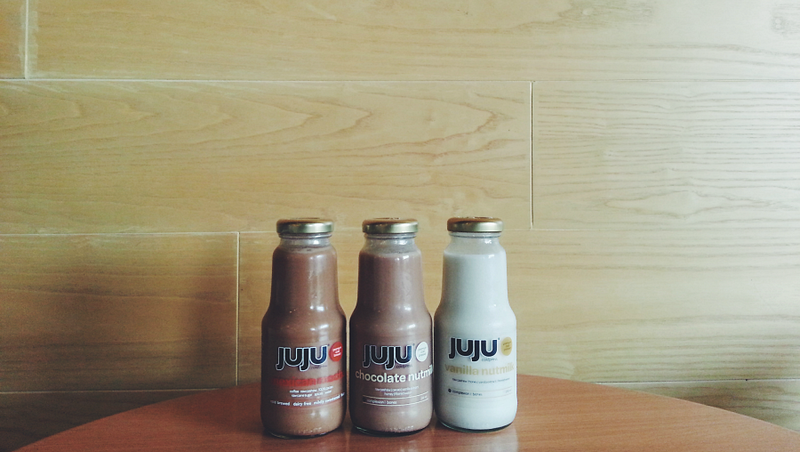 I've had a sip of the other two flavors, and we all agreed that the vanilla nutmilk is the best among the three. I know Mexican mocha would be spicy (because it was indicated and I can certainly tolerate spicy nowadays) but for a drink, it was just too much for me! Juju Eats irrefutably changed the way I look at eating vegetables now! Flavorful and healthy salads, wide variety of ingredients and convenient location! Don't forget to try the Roast Pumpkin and Crispy Catfish salad (I heard those were the bestsellers) as well as their coffee and smoothies! 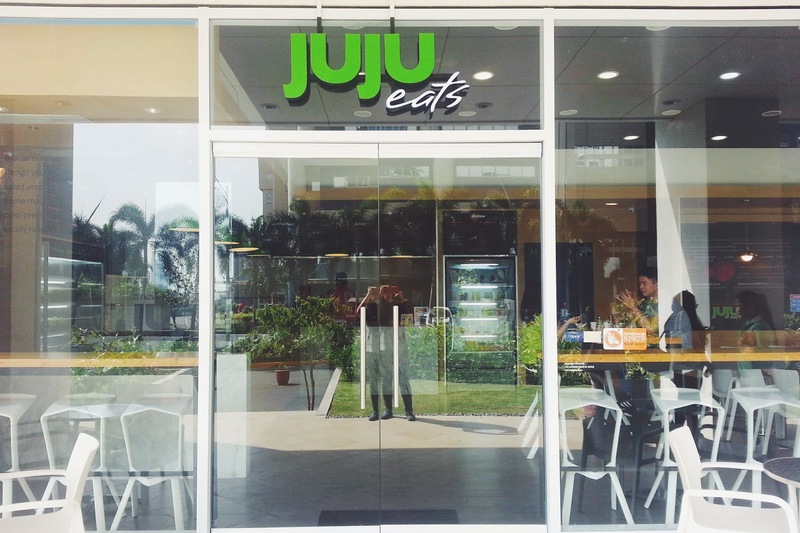 Been wanting to try Juju eats!